Arm cranking with Excy as an upper body ergometer offers so many amazing ways to build strength in your arms and shoulders, while also incinerating calories. In today’s live streaming challenge at Excy.LIVE, we explored what we call the Excy Swimmer motion for swim training. While it definitely doesn’t replace the amazing benefits of swimming, it can be a great swim training workout on the days that you can’t get to the pool! While those recovering from lower-body injuries or those who are wheelchair-bound often use upper body ergometers, pedaling with your arms can be an amazing cardio and strength-training workout for all. 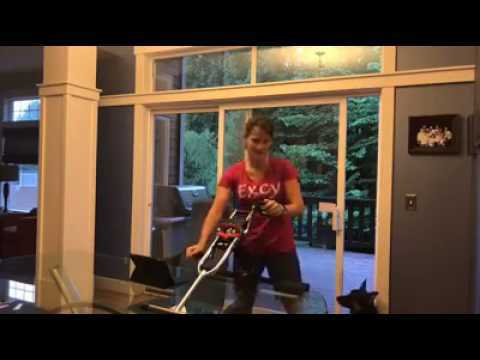 There are so many ways to use Excy as an upper body ergometer, ranging from simple arm cranking on your kitchen countertop to increase range of motion, to pedaling arms from the comforts of your couch, to upper body aerobic and anaerobic workouts on the floor. According to Joseph Warpeha’s article “Upper Body Ergometry: The Most Underused Aerobic Exercise” in the National Strength and Conditioning Association’s “Performance Training Journal,” you’ll experience a more substantial rise in your blood pressure during an upper-body aerobic workout when compared to a lower-body aerobic workout.